Recto: Two drawings of a sectioned skull seen from the left, the one below squared for proportion; notes on the drawings. Verso: Two drawings of the right side of the skull, the lower study showing the relation between the orbit and maxillary antrum; with notes on the drawings. In the upper drawing (recto), Leonardo places the senso commune, the supposed site at which the senses converged, at the intersection of three orthogonal lines, just behind where the optic nerves enter the brain. The lower drawing shows the skull sawn in half, with the cervical vertebrae included schematically. Leonardo locates the senso comune at the mid-point of the height of the skull and a third of the way back – resisting the temptation to place it exactly halfway from front to back, which would have been even more harmonious. As an artist, Leonardo wanted to find the relationship between the brain and the body – between an individual’s emotions, expression and pose, so that he could paint a figure more convincingly. Some of his earliest anatomical studies attempt to understand the structure of the brain, the paths of the sensory nerves, and the location of the mental faculties. 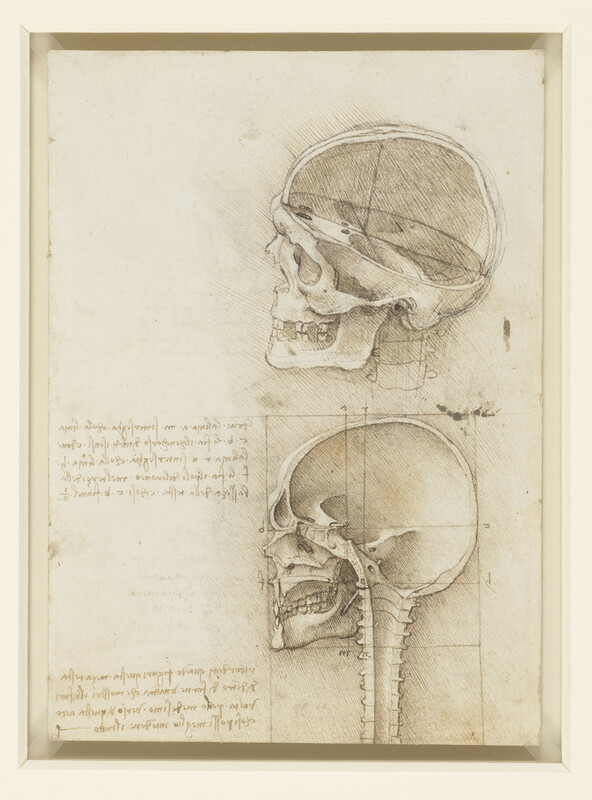 In April 1489 Leonardo obtained a human skull, and sectioned it to study its internal form and proportions. His grasp of three-dimensional structure is remarkable, and elsewhere he proposed an analogy between the dome of a cathedral and the cranium, which he saw as having an optimally strong design.